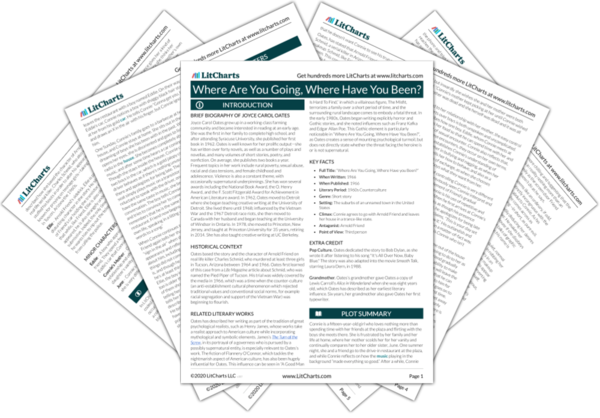 Instant downloads of all 946 LitChart PDFs (including Where Are You Going, Where Have You Been?). Welcome to the LitCharts study guide on Joyce Carol Oates's Where Are You Going, Where Have You Been?. Created by the original team behind SparkNotes, LitCharts are the world's best literature guides. A concise biography of Joyce Carol Oates plus historical and literary context for Where Are You Going, Where Have You Been?. 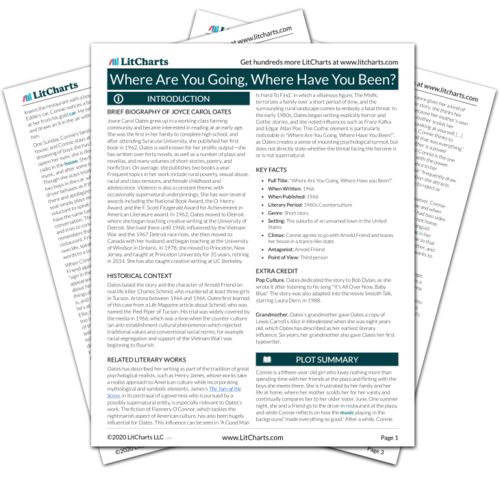 A quick-reference summary: Where Are You Going, Where Have You Been? on a single page. In-depth summary and analysis of every of Where Are You Going, Where Have You Been?. Visual theme-tracking, too. Explanations, analysis, and visualizations of Where Are You Going, Where Have You Been? 's themes. Where Are You Going, Where Have You Been? 's important quotes, sortable by theme, character, or . Description, analysis, and timelines for Where Are You Going, Where Have You Been? 's characters. Explanations of Where Are You Going, Where Have You Been? 's symbols, and tracking of where they appear. An interactive data visualization of Where Are You Going, Where Have You Been? 's plot and themes. Joyce Carol Oates grew up in a working-class farming community and became interested in reading at an early age. She was the first in her family to complete high school, and after attending Syracuse University, she published her first book in 1962. Oates is well known for her prolific output—she has written over forty novels, as well as a number of plays and novellas, and many volumes of short stories, poetry, and nonfiction. On average, she publishes two books a year. Frequent topics in her work include rural poverty, sexual abuse, racial and class tensions, and female childhood and adolescence. Violence is also a constant theme, with occasionally supernatural underpinnings. She has won several awards including the National Book Award, the O. Henry Award, and the F. Scott Fitzgerald Award for Achievement in American Literature award. In 1962, Oates moved to Detroit where she began teaching creative writing at the University of Detroit. She lived there until 1968; influenced by the Vietnam War and the 1967 Detroit race riots, she then moved to Canada with her husband and began teaching at the University of Windsor in Ontario. In 1978, she moved to Princeton, New Jersey, and taught at Princeton University for 35 years, retiring in 2014. She has also taught creative writing at UC Berkeley. Get the entire Where Are You Going, Where Have You Been? 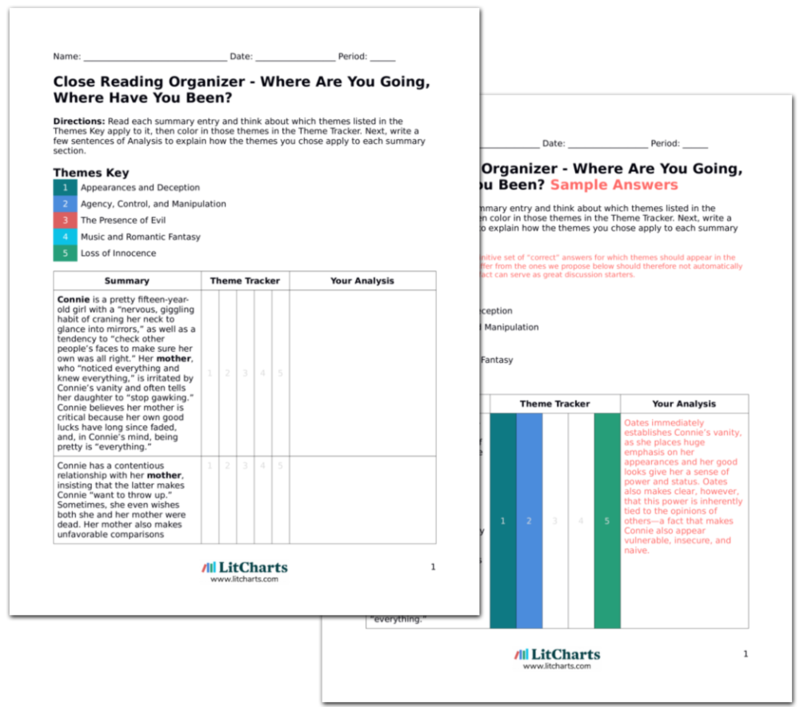 LitChart as a printable PDF. Historical Context of Where Are You Going, Where Have You Been? Oates based the story and the character of Arnold Friend on real life killer Charles Schmid, who murdered at least three girls in Tucson, Arizona between 1964 and 1966. Oates first learned of this case from a Life Magazine article about Schmid, who was named the Pied Piper of Tucson. His trial was widely covered by the media in 1966, which was a time when the counter-culture (an anti-establishment cultural phenomenon which rejected traditional values and conventional social norms, for example racial segregation and support of the Vietnam War) was beginning to flourish. Other Books Related to Where Are You Going, Where Have You Been? Oates has described her writing as part of the tradition of great psychological realists, such as Henry James, whose works take a realist approach to American culture while incorporating mythological and symbolic elements. James’s The Turn of the Screw, in its portrayal of a governess who is pursued by a possibly supernatural entity, is especially relevant to Oates’s work. The fiction of Flannery O’Connor, which tackles the nightmarish aspect of American culture, has also been hugely influential for Oates. This influence can be seen in “A Good Man Is Hard To Find,” in which a villainous figure, The Misfit, terrorizes a family over a short period of time, and the surrounding rural landscape comes to embody a fatal threat. In the early 1980s, Oates began writing explicitly horror and Gothic stories, and she noted influences such as Franz Kafka and Edgar Allan Poe. This Gothic element is particularly noticeable in “Where Are You Going, Where Have You Been?”, as Oates creates a sense of mounting psychological turmoil, but does not directly state whether the threat facing the heroine is or is not supernatural. Key Facts about Where Are You Going, Where Have You Been? Climax: Connie agrees to go with Arnold Friend and leaves her house in a trance-like state. Extra Credit for Where Are You Going, Where Have You Been? Pop Culture. Oates dedicated the story to Bob Dylan, as she wrote it after listening to his song "It's All Over Now, Baby Blue." The story was also adapted into the movie Smooth Talk, starring Laura Dern, in 1988. Grandmother. Oates’s grandmother gave Oates a copy of Lewis Carroll’s Alice in Wonderland when she was eight years old, which Oates has described as her earliest literary influence. Six years, her grandmother also gave Oates her first typewriter. Rainsford, Sue. "Where Are You Going, Where Have You Been?." LitCharts. LitCharts LLC, 13 Nov 2018. Web. 11 Dec 2018. Rainsford, Sue. "Where Are You Going, Where Have You Been?." LitCharts LLC, November 13, 2018. Retrieved December 11, 2018. https://www.litcharts.com/lit/where-are-you-going-where-have-you-been.